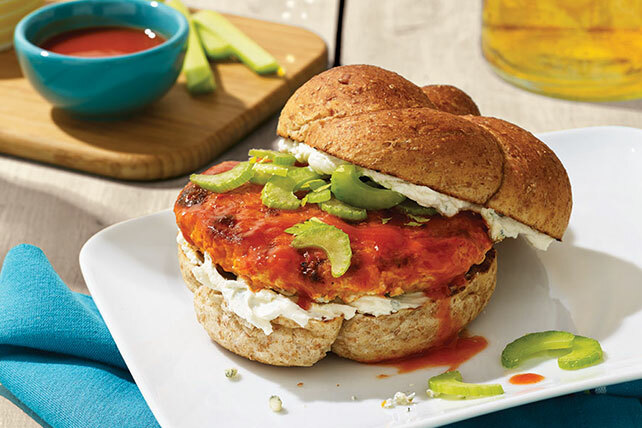 The classic Buffalo wings condiments—blue cheese, celery and hot sauce—are all here, ready to transform chicken burgers into family party fare. Drizzle milk over bread in medium bowl; let stand 2 min. Add chicken; mix just until blended. Shape into 4 (1/2-inch-thick) patties. Grill 5 to 7 min. on each side or until done (165°F). Meanwhile, mix cream cheese and blue cheese until blended. Spread cut sides of buns with cheese mixture. Place burgers on bottom halves of buns; brush with Wings Sauce. Top with celery; cover with tops of buns. Add buns, cut sides down, to grill to toast for the last few minutes of the chicken grilling time.